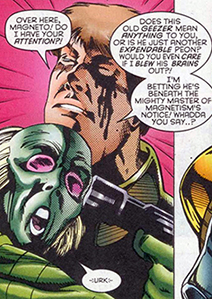 Powers/Abilities: A naturally gifted speaker, the mutant known as Orator had the power to form empathic connections with those around him. Not only could he use this to gauge people's emotional responses to whatever he was proposing, he could also verify if someone was being truthful. Apparently rather advanced in years, Orator did not actively participate in any of the Acolytes' combat missions (see comments). (Magneto I#1 (fb) - BTS) - At some unrevealed point (see comments), Orator joined the Acolytes. He was part of a splinter cell that defied Exodus' vision and struck out on their own. Making a new home for themselves in the Andes where large chunks of Avalon had landed (following its destruction at the hands of Holocaust), Orator and the others set up an underground base in the mountains where they planned to wait for the inevitable return of their savior. However, they soon found themselves hounded and surrounded by Humanity's Last Stand, the anti-mutant group sent in specialized troops called Razers to deal with the Acolytes. At the same time, Exodus and the remaining Acolytes were building New Avalon in the Arctic, a flying fortress which would kill millions when it was launched. (Magneto I#1) - Joseph, in an attempt to discover who he really was, travelled to the Andes where he planned to investigate the debris of Avalon. He was attacked by the Acolytes who initially thought he was an intruder out to defile their sanctuary, but were startled to find Joseph looked exactly like Magneto in his younger years. Feeling the energies emanating from Joseph's body, Orator concluded the silver haired man was speaking the truth when he said he was a mutant as well, there to look for a place called Avalon. Orator then invited Joseph to stay with them even though the other Acolytes clearly considered him a dead ringer for Magneto. (Magneto I#1 - BTS) - Concerned with the fact Exodus didn't seem to care launching New Avalon would cause millions of deaths, Amelia Voght tried to stop the powerful psionic mutant. He easily defeated her and would have killed Voght, if not for the timely arrival of Fabian Cortez who managed to convince Exodus to spare her life. Voght later told Cortez to go and seek out Joseph, the only man who could possibly stop Exodus. (Magneto I#1) - Despite Orator's impassioned pleas to the contrary, Joseph kept denying that he was Magneto or that the master of magnetism would ever return. Just then, a group of Razors (one of them piloted by Ethan) located the Acolytes and attacked. One of them ensnarled the helpless Orator in techno-organic coils while blasting Joseph with a spray of molten heat. Angered, Joseph unleashed the full force of his magnetic abilities and made short work of the Razors. This was all the proof the Acolytes needed that he, indeed, was Magneto. (Magneto I#1 - BTS) - A little while after the battle, Joseph located the part of Avalon that contained Magneto's private quarters. Inside, he found a spare costume and some of Magneto's old personal logs. Thoroughly confused, he was then approached by Fabian Cortez who pleaded with Joseph to help him stop Exodus' plans. Still unsure who he really was, Joseph decided that he needed to help stop Exodus as a way to atone for crimes he didn't even remember. He donned the costume and announced he would impersonate Magneto for the duration of the mission. (Magneto I#2 - BTS) - The Acolytes were less than happy to see Fabian Cortez, who had betrayed most of them not too long ago. They were ready to kill their former leader, but Joseph (as Magneto) ordered them to stop. Shortly after that, Cortez noticed the Acolytes were getting restless, sensing their savior was about to leave them. Joseph told them he couldn't ask them to accompany him to New Avalon, but the mutants' more immediate concern was a possible retaliation by Humanity's Last Stand. With a little pushing on Cortez's part, Joseph agreed to go on the offensive with the Acolytes and attack the mutant haters head on. The assembled Acolytes easily beat them, but didn't notice the Orator had been captured by the seriously wounded Humanity's Last Stand leader colonel Julian Armstrong. (Magneto I#2) - The Acolytes were startled when Armstrong showed up holding Orator hostage, a gun pointed to his head. However, Joseph easily disabled the weapon and knocked Armstrong out. Instead of leaving him to die, Joseph took him back to the Acolytes' base and even had their healer try and treat his wounds (to no avail). This uncharacteristic act of mercy towards a "flatscan" made the Acolytes doubt he really was Magneto. However, Orator and the others finally bought into Joseph's claims when he singlehandedly destroyed four nuclear missiles fired by Humanity's Last Stand in retaliation. Afterwards, "Magneto" created a plane out of thin air large enough to carry all the Acolytes to New Avalon for their confrontation with Exodus. Orator, presumably, boarded the craft as well (see comments). Comments: Created by Peter Milligan & Jorge Gonzalez (writers), Kelley Jones (pencils), John Beatty (inks). It was never made clear when Orator joined the Acolytes: Before or after the destruction of Avalon. He wasn't seen during that confrontation, but with the Acolytes in the aftermath being so scattered and stuck in remote parts of the world, it also seems unlikely he happened to run into them. Then again, there are quite a few previously unseen Acolytes running around the Andes during those first two Magneto issues. There's a bit of confusion regarding the full range of the Orator's abilities. He was seen giving a speech on the hand of Kamal, apparently shrunken down. Whether or not he was actually able to shrink or possibly project a psionic (handheld) image of himself to those he was in empathic contact with remains a mystery. Both his official profiles make no mention of either of these powers. Interestingly enough, Orator did not wear the traditional red, yellow and blue Acolyte costume, instead opting for a more rugged, black leather outfit with studs. What happened to him after Joseph took the Acolytes to fight Exodus in New Avalon is hard to explain. He didn't appear in the third and fourth issue of the miniseries, so it's possible he stayed behind at the Acolytes' Andes base. He also didn't make any other appearances, which leads one to conclude he either died (he *was* quite old) or that he was eventually among the millions of mutants depowered by the Scarlet Witch. 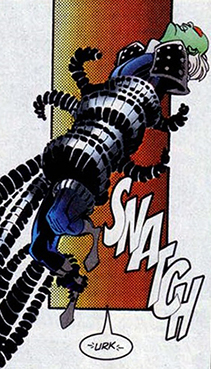 Orator, either solo or as a member of the Acolytes, was profiled in The Official Handbook of the Marvel Universe A-Z#1 (2008) and Marvel Encyclopedia: X-Men. His full name was revealed in the Acolytes' 2008 handbook entry.